There’s nothing quite like the “ick” factor of waking up one morning to a trail of what seems like thousands of tiny black ants marching across the floors of your home. Nearly all Portland residents have had this experience at one point or another as the Pacific Northwest is a mecca for ant activity. The sugar ant, also referred to as the Odorous House Ant or the grease ant, is by far the most common ant in the Portland metro area. These ants are small, usually black, and when found indoors are commonly located in bathrooms, kitchens, laundry rooms, or other areas of moisture inside a structure. Sugar ants are a year round nuisance in the Portland area, but tend to become a larger problem in late winter and spring. Around this time of year, the experts at Aspen Pest Control tend to see an uptick in local residents calling in to request assistance with sugar ant extermination. The term “sugar ant” is somewhat of a catch-all term for a type of ant that has an affinity for sweets. These ants also go by the name of “odorous house ant”, “stink ant”, and “coconut ant”. Glucose (sugar) is the ant’s primary source of energy. These ants seem like they’ll do anything for something sweet and sugary. Sugar ants have sensors located in their antennae that are excellent at seeking out and detecting sugary substances. Sugar ants are known to be extremely tough and resilient. Worker ants have been observed continuing to forage with missing and damaged legs. The queen will continue to lay eggs even if she has a crushed abdomen. Sugar ants always come from the soil outside of a structure. It’s possible that you have a tree or plant that secretes a sugary substance on the outside of your home. This may have drawn the ants to a location near your home. From this nearby proximity, the ant’s excellent moisture and sugar detection abilities inform them that there is moisture and food indoors—so to the frustration of homeowners, the ants move inside. Their small size allow sugar ants to gain access to a home in a number of ways. Cracks in foundation, gaps around windows and doors, missing or damaged vents and screens, small holes where utilities enter the home, or hitching a ride in on a plant or other article are just some of the ways in which sugar ants gain access to a structure. Once a sugar ant colony is established, sugar ants begin hatching inside the home and gaining access is no longer an issue. Once the ants have come indoors, it’s not uncommon for them to begin to nest inside of a structure. Since ants are made of cells just like we are, they require a regular water source for survival. They often nest inside humid and dark locations, such as the wall voids of a bathroom or kitchen, or in any location where moisture is found nearby. The good news is that sugar ants are relatively mild mannered in comparison to other ants. In rare instances, sugar ants will bite, but the result is usually not painful and only in rare instances where a person is highly allergic does the bite cause a problem. While some ants actually sting, and use a stinger to push venom into the skin, the sugar ant uses is mandibles to pinch. The pinch does much less damage to the human body than a venomous sting. Do sugar ants do property damage? In general, sugar ants do very little, if any, property damage. These ants don’t eat wood, so you don’t need to worry about them devouring your home like the termites in the old Looney Toons videos. Still, most homeowners don’t appreciate ants inside their home. If not treated, the ants nests will grow larger and more nests. This will lead to more indoor ants and an infestation that is far more difficult to treat. It’s always best to treat for ants at the first sign of a problem. How do I prevent sugar ants? – Take out any trash that contains food waste on a daily basis. Keep the trash can outdoors, if possible. – Clean up under dining spaces after each meal. – Don’t keep dirty dishes in the dishwasher. Run immediately after filling. – Keep all surfaces wiped down and free of crumbs or spills. – Hang garlic in your pantry. Garlic has a scent that confuses ants and can throw off their ability to detect sugar. – Pay particular attention to minimizing vegetation within at least one foot of your home. Be careful to avoid vegetation overgrowth in general on your property. – Don’t allow standing water to accumulate close to your home. This can be a big attractant to sugar ants. There are a variety of DIY methods for treating a sugar ant infestation. These methods usually include two approaches—baiting and quick kill treatments. IMPORTANT SAFETY NOTE: It’s important to note that most store bought baits and spray ant killers can be dangerous. These products are poison, and they can be very harmful, to both children and pets. If you choose to use these products, be sure to read the use instructions on the label and follow the instructions precisely. Baiting the ants with poison is probably the most effective home remedy for ridding a home of sugar ants. The quick kill sprays only take out the foraging ants and do absolutely nothing to address the vast number of ants that you can’t see. In fact, many over the counter sprays have a tendency to fracture ant colonies, actually making the problem worse within the home over time. Baiting products work when the ants bring the poison back to their nesting sites. However, many of the baits sold over the counter are less effective than the commercial grade baits used by professionals. Figuring out which products to use, where to place the products, and most importantly, how to conduct safe ant extermination can be a challenge. We find that most homeowners want the pests eradicated and prevented from future entry, rather than just removed for a couple days. Don’t hesitate to reach out to an experienced exterminator for help with ant control. Aspen Pest Control’s experienced pest control technicians can inspect your home to gauge the extent of the ant infestation and help you determine the best treatment. One of the most common complaints Aspen get from homeowners fed up with an ant problem is they’ve tried the over the counter baits and sprays and while they help reduce the problem for a time, they generally only work on a short term basis. Aspen uses specialized “non-repellant” sprays and baits that are specifically designed to get to the source of an ant problem by breaking the ant’s reproductive life cycle. 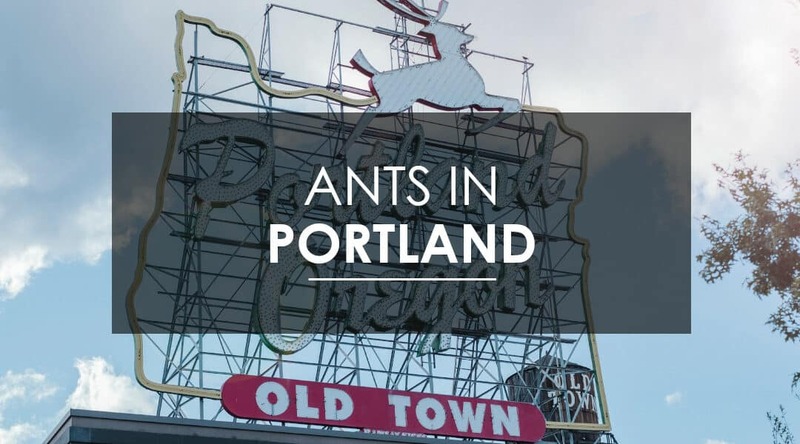 While ant control in Portland, OR can be a process even for seasoned professionals, Aspen’s ant treatment has been proven to work thousands of times over and comes with a free re-service guarantee. What this means is that for Aspen’s regular customers, if the ants come back, Aspen will come back and retreat the home absolutely free of charge. Who can I call for ant extermination in Portland? If you’re currently experiencing a problem with sugar ants—or any type of ant—know that you’re not alone. Ant infestations are a common problem in the Portland, OR area. It’s something that nearly all Portland residents have to deal with at some point in time. Aspen Pest Control loves serving our Portland community including family homes and businesses. We have successfully treated many homes in Portland for all types of ants. We know that the stress induced by putting up with these little pests is simply not worth it. Contact us to discover why your neighbors in Portland are loyal customers of Aspen Pest Control.